With VintageView wine racks the size of your wine collection is secondary - whether modest or extensive, these wine racks adapt to nearly any size wine storage area. 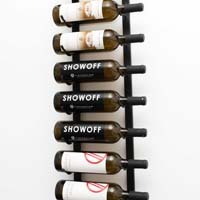 The VintageView WS31 wall-mounted wine rack has an overall height of three feet and holds up to 9 wine bottles. Available in Wine Bottle Green, Black and Nickel finishes. Comments: Excellent product but they were mounted on a stone wall with different anchors than were provided. This was anticipated.